Emblem/Atlantic recording group Matchbox Twenty and Warner Bros Records recording group Goo Goo Dolls will embark on a co-headlining tour throughout North America this summer. The tour will kick off on June 25th at the Verizon Wireless Arena in Manchester, NH and run throughout August (see attached itinerary.) Matchbox Twenty fan club pre-sale tickets will be available beginning March 20th at www.matchboxtwenty.com. The band will also be teaming up with Tickets-for-Charity to offer fans some of the best seats in the house to benefit City of Hope. These tickets will be available exclusively at www.ticketsforcharity.com. Goo Goo Doll fans will be able to pre-order the band’s new album, “Magnetic”, and gain access to pre-sale tickets via www.googoodolls.com. Select dates for the tour will go on sale March 23rd. Fans may visit each band’s respective website for additional ticket information. 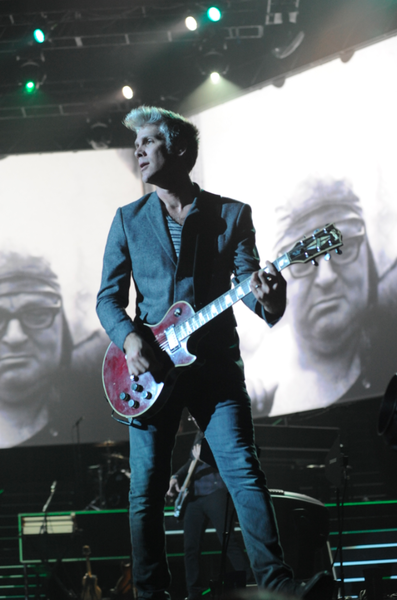 Matchbox Twenty is currently in the midst of their sold-out North American tour, following a sold-out Australian leg, celebrating last year’s blockbuster album, “NORTH.” The album exploded into the #1 position on the SoundScan/Billboard 200 after its first week in release. Fueled by critical acclaim – as well as the hit singles, “She’s So Mean” and “Overjoyed” – the album’s unprecedented success marked the band’s first-ever chart-topper and #1 debut. The album’s third single “Our Song,” which is set to impact radio shortly, may be heard here. The band recently announced the first-ever “Matchbox Twenty Cruise”-chartered by Rose Tours, aboard the Carnival Imagination. The musical voyage will get underway December 6th-9th, sailing roundtrip from Miami, Florida to Nassau, Bahamas. For more details and up-to-the-minute information, please see www.matchboxtwentycruise.com. Goo Goo Dolls new album Magnetic is set for release May 7, 2013. The debut single from Magnetic, entitled “Rebel Beat” is currently climbing the charts at radio. Listen to "Rebel Beat" here. The Buffalo, NY trio, singer guitarist John Rzeznik, bassist Robby Takac, and drummer Mike Malinin recorded Magnetic in New York, London and LA with Gregg Wattenberg (Train), Rob Cavallo (Green Day), John Shanks (Bon Jovi), and Greg Wells (Katy Perry). Magnetic is the tenth studio release for the Goo Goo Dolls, who have become one of the most globally respected and influential forces in popular music history. Matchbox Twenty has sold over 30 million records worldwide, and earned countless accolades, including five GRAMMY® nominations, four American Music Award nods, and the 2004 People’s Choice Award for “Favorite Musical Group.” Furthermore, Rob Thomas has proven one of the most highly decorated artists of recent years, receiving three GRAMMY® Awards, 11 BMI Awards, the first ever Songwriters Hall of Fame Hal David Starlight Award, and two Billboard “Songwriter of the Year” honors for both his chart-topping solo work as well as collaborations with such legends as Santana, Mick Jagger, and Willie Nelson. Thomas’ collaboration with Carlos Santana on “Smooth” was also named the #2 “Most Popular Song Ever” on Billboard’s list of the “100 Most Popular Songs Behind ‘The Twist.’” He was also named to Billboard’s “Top 20 List of Hot 100 Songwriters 2000-2011” at #5, and was the top ranking artist/songwriter on the list. Goo Goo Dolls have sold millions of albums worldwide, with 14 Top 10 Radio hits, more than any other artist in the history of the Hot AC format. They have been nominated for four GRAMMY Awards and are the only artist to have three songs on Billboard’s “Top 100 Songs from 1992-2012" including the Number One slot, for “Iris.” “Iris” spent nearly 12 straight months on the Billboard charts and held the Number One position for 17 consecutive weeks. John Rzeznik has been honored with the Songwriters Hall of Fame Hal David Starlight Award and they have shared the stage with everyone from The Rolling Stones to Taylor Swift, who recently covered "Iris" with Rzeznik onstage. Head over to the events page to see all the tour dates.